Three months ago at the BNP Paribas Open, Sachia Vickery first appeared on the radar of many sports fans when she flashed the “Wakanda Forever” salute after her win over the No. 3 player in the world, Garbine Muguruza. On Monday, Vickery, 23, stepped into the spotlight again by lashing out at trolls on social media, unleashing firm and steady backhands that might earn her consideration for a social media position with Wakanda’s female security team, the Dora Milaje, from Black Panther. 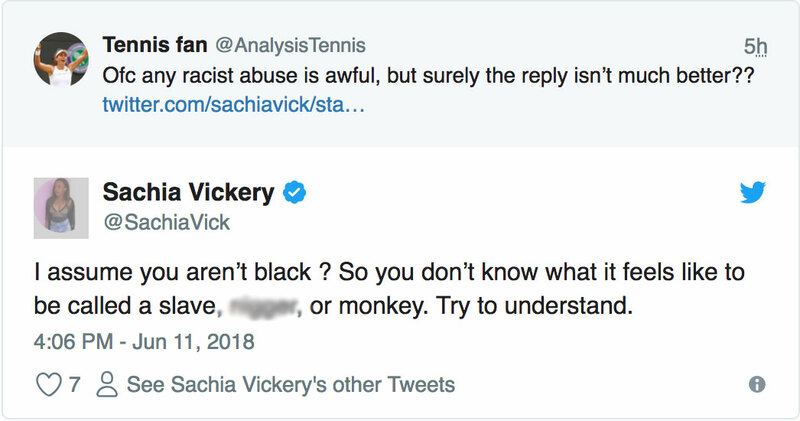 Vickery, speaking to The Undefeated from England, where she’s playing grass-court matches in preparation for Wimbledon, said she often encounters hateful messages and comments on her social media pages, including many with racial overtones. “If I shared some of it with you, you’d be shocked,” Vickery said. “Being black, I’ve been called monkey, slave, the N-word, housekeeper, the help — pretty much every racist name out there on planet Earth. Monday was that day for Vickery, who, trolls aside, is enjoying a breakthrough season that includes her signature win over Muguruza in Indian Wells, California. Vickery, instead, decided to let off steam and make good on her promise. Racism involving athletes is a problem, whether it’s a fan taunting San Antonio Spurs guard Patty Mills during a game, the N-word being painted on the gate of Cleveland Cavalier LeBron James’ home, or a soccer player from England suggesting his family skip the World Cup for the fear of racial abuse. By revealing their opinions and lives on social media, athletes and others expose themselves to keyboard thugs who become emboldened by distance and anonymity. Vickery said she’s received abuse ever since she’s been on social media, and she has occasionally dropped her accounts. She says many comments come from gamblers, and she’s even received some threatening comments on her phone.